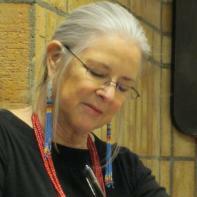 Linda Hogan (Chickasaw) is an internationally recognized public speaker and author of poetry, fiction, and essays. Recent books are Rounding the Human Corners, a Pulitzer nominee, and People of the Whale, also a Pulitzer finalist. Next year her new book, Dark. Sweet. New and Collected Poetry will be published. Her work has received the Colorado Book Award, Minnesota State Arts Board Grant, an American Book Award and a prestigious Lannan Foundation Fellowship, among others. Hogan was inducted into the Chickasaw Hall of Famein 2007 and has recently been the Writer in Residencefor The Chickasaw Nation. This interview was conducted via email by Interview Editor Erin Regan. Of the process she said, “I was so thrilled to be able to interview Linda Hogan, whose voice stays with me long after I put down each of her books. Her words here and in her texts changed the way I think about the language of the natural world and how we respond to that natural voice.” In this interview, she discusses the ancient stories that influence us, the consequences of modern communication, and the wealth of nature. Superstition Review: Much of your work deals with the limitations of human language. In an essay from your anthology Intimate Nature: The Bond Between Women and Animals, you write, “It is clear there is a vocabulary of senses, a grammar beyond that of human making.” Will you please describe your approach to mitigating these limits as a novelist and poet? How important is sensory detail in your writing? Linda Hogan: We live in a world of many intelligences. Human language isn't all that is spoken in the world around our lives. Other documented and studied languages exist in the animal world. They surround us, also, in the plant world, where trees have the ability to call helpful underground bacteria toward them from distances, to communicate with one another through hormonal and chemical means. Cedars and junipers even store moisture to release for hardwoods during times of drought. We are surrounded by voices intelligent and in need of respect. But what I think you may mean are the ways in which we sense the world in ways beyond language. For me, I write to put words together in ways that express what can’t be said in the ordinary use of language, particularly the way a poem feels, goes not only through the mind, but through the heart and body, as well. With poetry, I’d like it to first bypass the mind and give off a particular feeling, then if someone wishes, they can return to it with their mind. I want it to be accessible, also, to every person and not just to other poets or people who have studied poetry. SR: In People of the Whale, you write that stories, like the earth, have the power to birth new worlds. A story is “circular as our planet and fluid as the words of the first people who came out from the ocean or out of the cave or down from the sky.” What creation stories have influenced you? Do you see your own work as a type of creation? LH: I think this relates back to the first question. Stories have the capacity to make change in ways that other forms of activism don’t. Like the trees calling beneath earth. Also, stories have the ability to remain with a listener or a reader that other kinds of information escape. Sometimes I think of them as a form of activism, sometimes as an expression of love, or the meaningful humanity of our daily lives. As for creation stories, these are a different thing altogether. As tribal people, we all have had them for as long as can be recalled and they are passed on. We accept those of one another, not expecting there to be only one. The Bible contains one creation story in Genesis and it is very similar to some indigenous creation stories, except that in many of ours, we had the assistance of animals or other elements to help us in our first being. I find them interesting to compare. As for us, we came from the earth. And Joseph Campbell, I think, has said that those of us who came from the earth have different kinds of gods, and a different care for the earth, than for those who come from monotheism. I like the way worlds are spoken, dreamed, or brought into existence by singing, the ways humans were created of clay or corn or whatever it was that we are made of. But mystery, after considering and comparing all the stories, is most appealing. What are we and how did we come into being? How absolutely amazing all the life forms and their origins. SR: Your prose is written with such beautiful rhythm and phrasing it often reads like poetry. How does your prose influence your poetry and vice versa? LH: I was a poet first and when I began to write fiction, it was like having that language as a first language and so I think poetry has become the way my inner self hears or sets down everything, the story or the essays I write. Poetry writes it down, with its attention to detail, to music, to the resonance of words placed together in particular ways. SR: In your poem “Restless,” you write, “Even the earth wants to journey. / Today the sands of Mongolia / fill this sky with dust / from great distances, / the long glide of foreign atoms, different light.” Would you please describe your approach to embodying the earth in your writing? LH: I like that. The embodied earth. What could be more true? It has always, from childhood, been a living organism to me. I used to imagine us as a cell in a body of other cells, as in a bloodstream. But it is true, we are a small earth and it has its own will and responses to what humans do. I recall when that sandstorm in Mongolia was seen from such far distances. From Mongolia! The poem began from those storms. Everything that happens in one country is carried away to others, through air, through ocean. Radioactivity shows up long distances away. Our plastics travel in the ocean to other continents. Now there is plastic sand, the ground-down drinking bottles of America, which have become the dead beaches on islands in the Pacific. These were once places the indigenous people depended on for food sources and which are now completely dead. We forget how small the planet has always been and it becomes smaller with each catastrophe. We also now have ways to communicate across and beneath oceans, to know what is happening not only to our embodied planet, but to people in other locations, attacks on innocent protesters, wars we might not have known existed, and that has allowed us to become more conscious humans on this earth, to know we have kin everywhere and the earth, as a living body, is one. SR: In “The Night Constant,” you describe the human desire for control over nature and simultaneous ignorance of animals. What can humans learn from animals that so far we’ve ignored? How do you use poetry to illuminate these lessons? LH: I am trying to think back to that poem, so long ago. It seems to me it was about a mountain lion, but I simply have forgotten the entire content. I don’t think we have much control over nature, but some humans do try. Right now, as the climate summit meets, we are aware that the elements of the natural world are greatly affected by our actions in ways harmful to us. We can’t control the earth’s response to our actions, only our own behaviors. We need to try to control ourselves, and our corporations. I hate to go political on this interview, because I live in an environment, also, where I am always aware of wildlife, of the amazing inhabitants around me, the crows that nest by the thousands down a flyway and in a location I haven’t ever found, but many of them appear just at the first of dawn, in great and noisy numbers. I also have to be wary of the presence of mountain lions whose territory is here, occasionally of my position with where the bears might be. Also, for a while, a pack of wolves were here, having probably come down from the fires in Yellowstone. Since then I moved away for a while and returned only months ago, so I don’t know if they are still in the region. They were beautiful and ghostly and I had taken a class on wolf biology many years ago, so I was very interested in these five wolves that entered this habitat. All of the animals I have known enter into my writing, become it. They are inspiration, research, and also my love. SR: In your first novel Mean Spirit, you discuss the exploitation of the Hill Indians and their land, which is rich with oil. Often this corruption plays out through women’s bodies because, like the oil-rich land, “the women were business investments.” What connections do you see between women and the earth, especially in their use as monetary resources? LH: That novel centered on reality and in that reality, women were the way for white men to acquire land. It is more about murder and theft, the true stories of what happened during the Oklahoma oil boom. The FBI formed around this case. Suddenly, those who had been sent to poor lands, Indian Territory, (the US tried to move all tribes there, then planned to build a wall around the area) were found to have underground oil. It was almost like the beginning of now, isn’t it? The letter from the man looking for a wife is taken from a history book, and is not fiction. The Hill People were traditional and wanted no part of this fracture in their world. As always, even people who manage to escape for a time from the invading forces are eventually overtaken. In fiction, this is so much easier to express than in history because a story carries the heart with it. It is not abstract, but is more alive with the developed characters and the telling. Yes, women were primarily victims in this historical process, although they have also been at other times. I always think of Lewis and Clark, their story. It is not really their story at all. It is the story of Sacajawea who knew the way, took them along, saved them from mishaps, kept them fed, negotiated their entry into different tribal territories. The story, really, is hers. And she was still just a girl. Yet, women have been omitted from Native histories and so little is found that it is an effort to find information, even for scholars. So I like to center stories that are also history, with women as integral forces within the story. SR: Mean Spirit has been described as both magical realism and historical fiction. Did you have these genres in mind when you began writing your novel? Will you discuss the integration of magical and historical elements in your narrative? LH: No. I never have anything in mind except how in the world am I going to do this book? Just trying to get the story down and keep track of it is enough for me to handle. Interestingly, the parts people think of as magical realism are the truth in this book. And the fiction is there to weave the truth together. I don’t have plans or outlines, although sometimes I hear the characters speaking inside my inner ear, or I see what is happening. The novel I am doing now probably needs that kind of planning because it is so complicated and so far no one has been fond of it except me. I love it, but it seems confusing to everyone else. Maybe it will be one of those books that never come together. But I do know other people plan, outline, then fill it in afterwards. It just wouldn’t work for me. It would kill my imagination and what the book itself wants to speak. I always feel true to the work. SR: Wall symbolism becomes central to the storyline of People of the Whale—Thomas builds a physical and emotional wall around his life, walls spring up between communities and their traditions, and the U.S. government constructs the Vietnam Wall to commemorate lost lives. How do symbols such as this develop in your writing process? LH: That is a question best left to scholars. As for me, I see it when you ask it, but would never have planned it in advance. Going to The Wall was something he just had to do in order to become aware. To help heal. He built a wall because he needed to be alone, hidden, because he had such complicated feelings and contradictory ones. It came down when he began to open once again to the world. To not be closed. Also, he returns to assisting the elders and to learning from them, to traditional ways, which seems to appear in all of my novels. It is also in Power in terms of what decision Omishto makes in her life. It is definitely in Solar Storms. It is of importance to me, as a writer but primary to me as a Native woman who is minded in that direction. LH: Email takes away my writing time and I miss that time, but what can be done? It is how we communicate now and how we find news and information. It is also something I am not good with because it is overwhelming to have so much of it. As for cell phones, it depends on their use. My brother and I watched families sitting out at restaurants, each either texting, or looking at something, maybe playing games, and we thought it was very strange and a large separation from one another. On the other hand, I need to keep in touch with grandchildren, to be able to call for help if there is an emergency, to have a phone with me. Lives are saved by them now. Also, what would we have known of China’s oppressions in the past, or our own, or the wars or chemical weapons use in other countries without someone sending out information? LH: Writing space. I don’t have any yet. I am waiting for a best-seller. For now I work all over the house, early morning in bed sometimes. When I moved, file cabinets, some furniture, and desk were stolen by Oklahoma con men. I just bought two used file cabinets and can’t wait to get some stacks of papers off the floor. I think I have never been well organized, but now it is total chaos. And as a brain injury victim, the chaos is very difficult sometimes. Whatever it is that people believe about the lives of writers only applies to writers who have great incomes, I believe. I am not at that level yet. If that day comes, I will be thrilled. I’ve seen the lives and homes of other writers who do sell well and so I have some ideas about how I will design it all, the perfect office! My dream. On the other hand, I have the amazing land around me, and the animals, so perhaps I can say all of that outer world, trees, mountains, animals, all that is my writing space! In which case, I have great abundance, great, great wealth.